Cottage Elements: Live from New York . . . .
Live from New York . . . .
Live from New York . . . it's Sue Whitney of JUNKMARKET at the French Flea and Round Barn Potting Co! 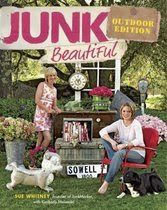 Just off of her most recent visit in New York City with Kathie Lee and Hoda on the Today show, Sue Whitney of JUNKMARKET Style, will be signing her latest book, Junk Beautiful - Outdoor Edition, which was released on March 31, 2009 , at the newest of the Twin Cities Occasional Sales, The French Flea, in Anoka, MN on Saturday, May 16 from 10-12 and the Round Barn Potting Co. in Andover, MN from 2-4. It all began in 2000 with a five year business plan, very little cash (try getting a bank to fund a junk business,) and a whole lot of determination. You know what they say: 'no guts, no glory!' The JUNKMARKET got underway as a retail business that sourced, transformed, and sold good junk. Back then, they traveled the country in search of junk to take back to the workshop in Minnesota for re-purposing. That tiny workshop soon became a haven for junkers far and wide who not only wanted to buy JUNKMARKET creations, but to learn how to create and style their own junk décor. JUNKMARKET’s emergent appeal led Sue to her ultimate goal of sharing her stylish reuse, recycle, and re-purpose message on a national level. It didn't take long for the rest of the country to discover and embrace the junked-up style. In 2003, Sue became one of the nation's premiere 'junk experts' as an editor-at-large and columnist for Country Home Magazine where she shared her ideas with fans until 2008. During that time she also appeared regularly on HGTV's "Country Style." Her first book, a shared collaboration with Ki Nassauer of Junk Revolution, Decorating Junkmarket Style: Repurposed Junk To Suit Any Décor was released on March 8, 2005. The premier issue of JUNKMARKET’s magazine hit newsstands on May 2, 2006 and the second magazine which included an informational DVD, was released in January of 2009. Her best seller, another collaboration with Ki, Junk Beautiful: Room by Room Makeovers with JUNKMARKET Style was released on March 25th, 2008. Sue is a nationally renowned and sought-after public speaker and makes numerous television appearances, including repeat visits to NBC’s "The Today Show." You've been tagged...see my "6 Things About Me" post. I like the picture you have up at the top of your blog. Picture Holder Perfect for a Crash Test Dummy! New Booth at the Buffalo Nickel! It was a Hot Time in the Old Town! The French Flea - The Sale Results!